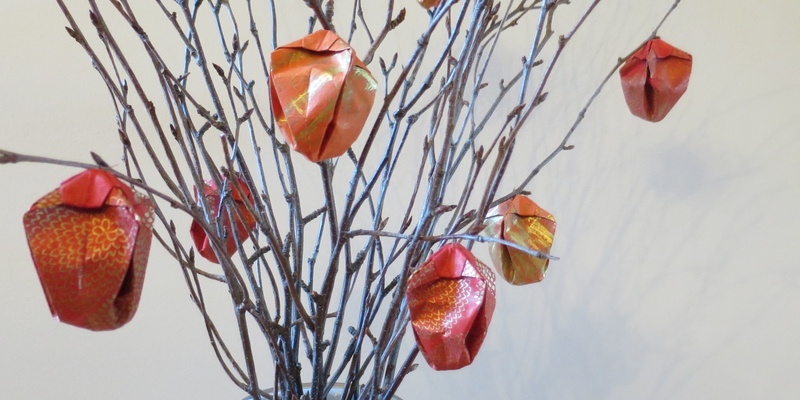 For this Iron Craft challenge we were to make something using the colors of fall. 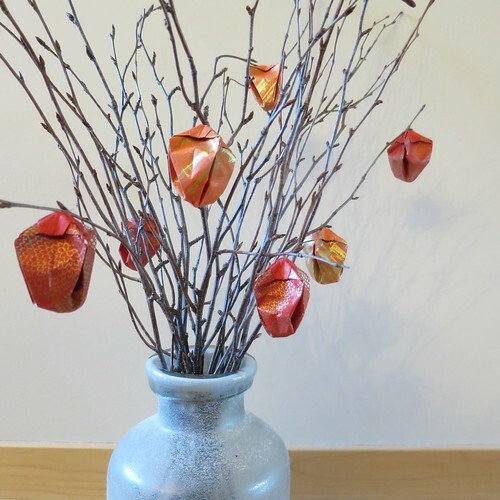 I was also inspired by a plant I often see in flower arrangements this time of year, the Chinese Lantern. 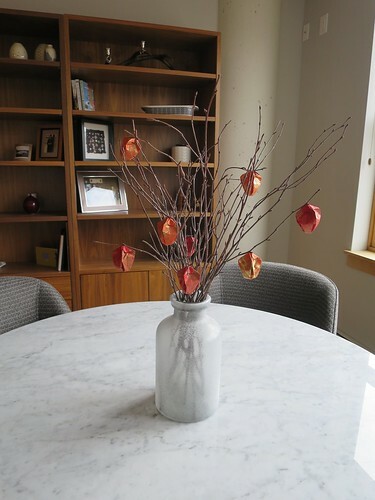 I had actually gone to the farmer’s market a few weeks ago, hoping to find some to use in my fall decorations around the house. I could only find them in large arrangements. 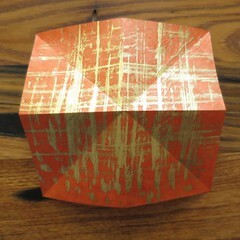 That got me wondering if I could create something that looks similar with paper origami. 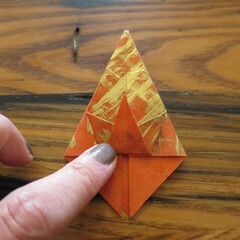 My husband has more experience doing origami than I do, so I posed the challenge to him. 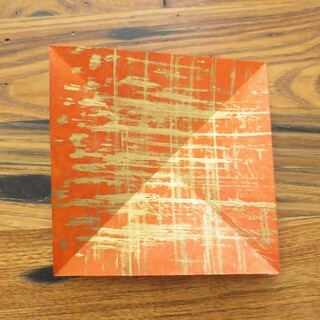 We spent a fun evening experimenting with different shapes and came up with this. 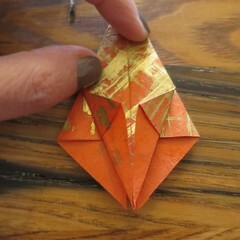 The shape is adapted from the Strawberry pattern in the book, The Origami Handbook. 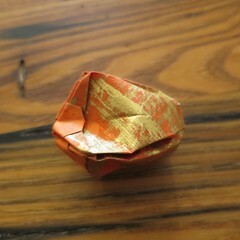 It is not the exact shape of the real Chinese Lantern, but I think it gives a similar effect. 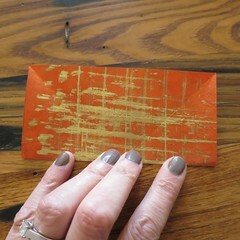 We found really pretty rice paper in red and orange with gold patterns on it at Paper Source. I didn’t even use half a sheet of each color. They catch the light beautifully in the morning when the sun shines in. 1. Cut the paper into squares. 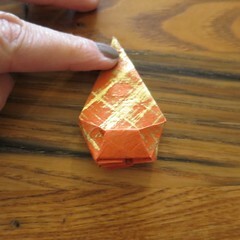 Mine were 5″ x 5″, anything smaller is really difficult to fold. 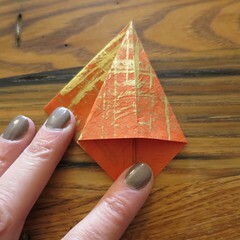 Start with a square of rice paper (mine with 5″ x 5″ any smaller is really difficult). Place the paper with the side you want facing out up. 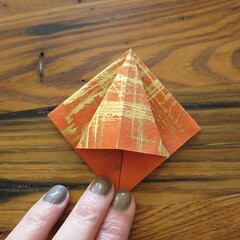 Fold it in half diagonally and crease. Open and do the opposite diagonal. Turn the paper over. 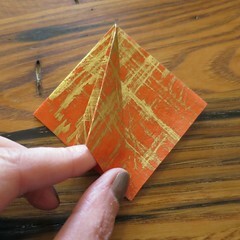 Fold in half and crease. Open and fold in half the opposite direction. Turn the paper so the right side is facing you. Grab it on both sides of one of the straight folds. 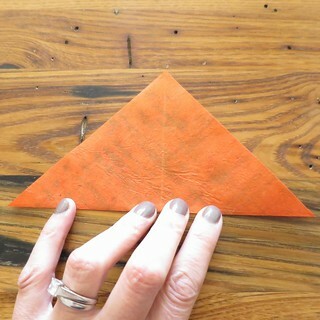 Fold in on the creases you made to make a triangle with a solid front. Place so the open end is facing you. Take the right flap and hold it so it is standing up. Press it down so that is forms a triangle with the crease down the middle. 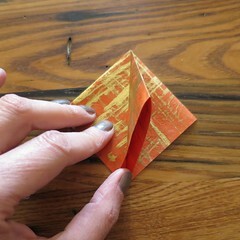 Now fold the right flap over (it is a but like turning pages in a book, so that is how we will talk about it), opening another diamond and repeat the last step. 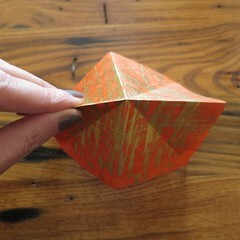 Repeat with the other two full diamonds (I found it was easiest to get to them by paging to the left) then turn the pages until you have a full kite shape facing you. 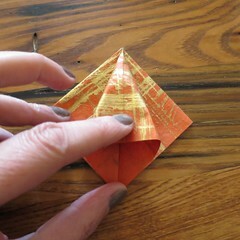 Fold up the bottom of each side of the “kite” until it is lined up with the center crease. 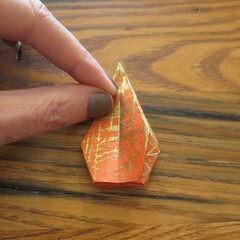 Fold the bottom point up and tuck in under the last two folds. Turn the pages and do the last two steps three more times on each full “kite”. You will end up with this. 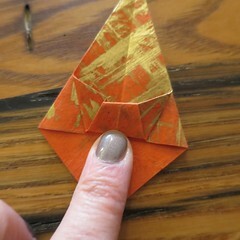 Flip the pages of your piece until you have a full one with no folds facing you. 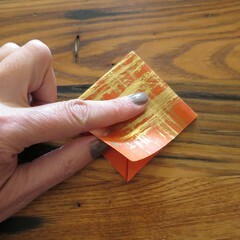 Fold up the the bottom corners to meet the center crease. Flip the pages and do this to each full one, a total of four times. 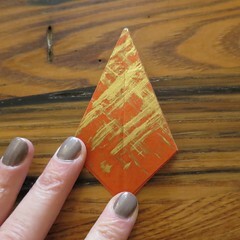 Now hold you piece so each of those pairs of last folds you did is facing in on itself. Hold two opposite pairs together and blow through the hole in the middle to inflate. Once I have a shape I like, I like to glue the four sets of folds at the top (each set it glued together, they aren’t all glued to each other). This helps hold the shape. 3. 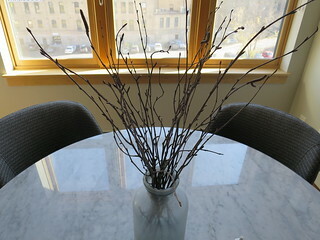 Arrange the branches in a vase. 4. Use the sewing needle to put a piece of thread through the top of each lantern (the top is the side with the hole.) 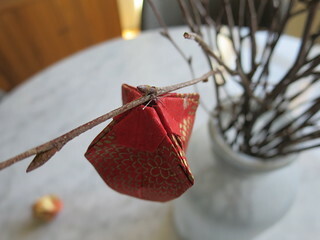 Tie the lanterns onto the branches using the thread. I tied mine on at places where branches met or there was a bud. Trim the ends of the thread. Add as many or as few lanterns as you wish. 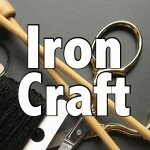 4 years ago by Kat in Challenges , Craft Projects , Crafts , Iron Craft , Projects | You can follow any responses to this entry through the RSS feed. You can leave a response, or trackback from your own site. First of all, I love this project. Second of all, I can’t believe that you have an origami book that I don’t have in my library. Finally, props to you on a very clear and well explained tutorial. I tried to explain my obi ring folding (with pictures) and eventually gave up. You have inspired me to try again. Thanks! I think that book is out of print now which might be why you don’t have it. You are right, it was tricky trying to photograph it. It would have been much easier if I could have photographed Matt doing it. That is making me laugh (about the book) Writing a clear tutorial is HARD work. It is simple to YOU, but not simple to EXPLAIN. That is a beautiful project. I love the way the lanterns turned out.